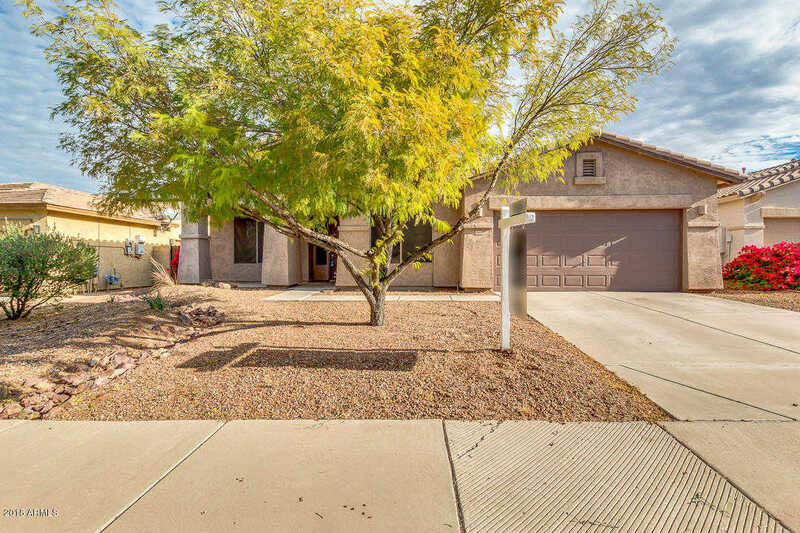 Immaculate move-in ready 4 bed, 2 bath single level home in Estrella! This home offers a family room, study, great room, large storage room, spacious kitchen with new granite countertops, tile backslash, kitchen island, black appliances, gas range, eat-in kitchen, built-in desk. Tile flooring throughout besides one bedroom & formal living/dining room. Large master suite with dual sinks, separate tub & shower, custom walk in closet, & glass sliding door exiting to your spacious covered patio and backyard. You won’t want to miss this one!Nearby to golf course, parks, 2 lakes, 2 Resident centers with gyms & pools, dining options. Directions: West on Elliot, Right onto San Gabriel, Left onto Sunrise, Right on 184th Dr to your home on the right. Approximate size: 8320.00 sq. ft. Please, send me more information on this property: MLS# 5853742 – $283,000 – 10051 S 184th Drive, Goodyear, AZ 85338. I would like to schedule a showing appointment for this property: MLS# 5853742 – $283,000 – 10051 S 184th Drive, Goodyear, AZ 85338.